Antlers grow faster than any other mammal bone — a big bull moose can grow an 80-pound rack in a summer, adding a pound of bone a day. While genetics has an influence on antler growth and size, nutrition is by far the most important factor, and males in high quality habitats grow much larger antlers. In the early stage of growth, antlers are covered with a fuzzy skin called velvet, which contains a tremendous concentration of nerves and as well as a supply of blood. The velvet nourishes the growing antler for about five months, during which time the antlers are extremely sensitive to touch, and if injured, may be permanently misshapen. Eventually, when the bone stops growing, the velvet is shed. 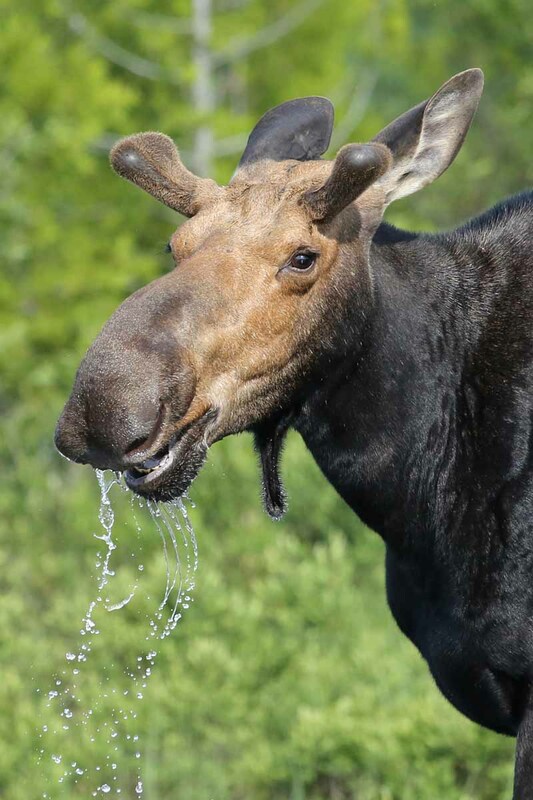 Bull moose then use their antlers to attract and fight for mates, as well as to root plants from the pond floor. A month or two after they have served their purpose of securing a mate, antlers are shed. In moose, antlers may act as large hearing aids. Moose with antlers have far more sensitive hearing than moose without, and a study of antlers (with an artificial ear) confirmed that the antler behaves like a parabolic reflector.